Lock in a great price for Hotel Loge – rated 8.6 by recent guests! The staff were very friendly. They didn’t have their own car park but I could park just outside when checking in to drop off my suitcase and again when checking out. The car park was only a few minutes walk away. The room was very comfortable and I wasn’t offered a complimentary drink when checking in. 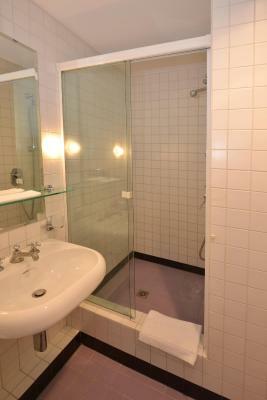 The property was in a great location in a walking area of the town. Close to the Christmas Market, shops, and restaurants. Staff was friendly and helpful. Breakfast was included and was classic. Would definitely come back. On the third morning before check-out I found that the view out of the window is fabulous! Clocks of the central church were facing my window! Great Broetli!! Staff was extremely cheerful, friendly and helpful. 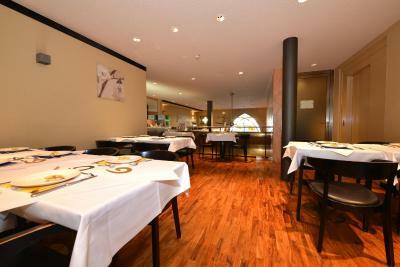 Great location for shopping and dining out. Train was easy to get to. Rooms are small but ok for a few nights stay. Close to the centre about a 10 min walk from train station. Staff good and it has a nice little bar. The staff were friendly, helpful and being a small hotel it felt more personal. The hotel had a great bar and was it fun just walking downstairs to watch a movie. Winterthur didn't feel touristy and although not a big town had a great selection of bars and restaurants to choose from and was close to the airport. 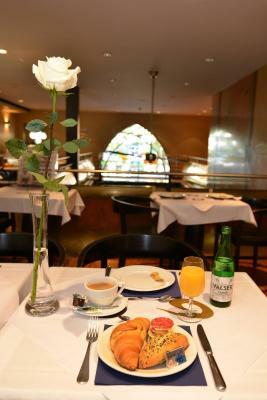 The convivial atmosphere and wonderfully friendly staff add to the central location and welcoming bar. Perfect for an extended business trip. Hotel Loge This rating is a reflection of how the property compares to the industry standard when it comes to price, facilities and services available. It's based on a self-evaluation by the property. Use this rating to help choose your stay! 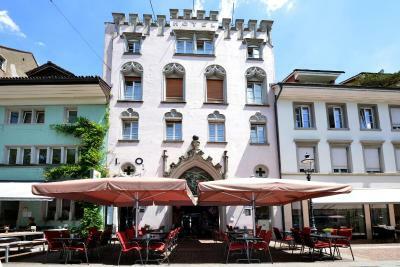 The Hotel Loge occupies a palace-style building in a central and quiet location at the edge of the pedestrian area of Winterthur. 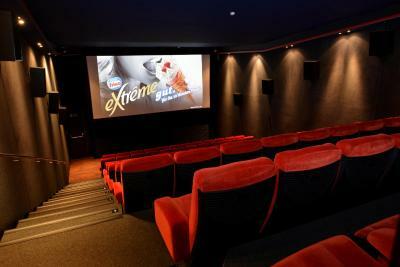 It features an in-house cinema and offers free WiFi. 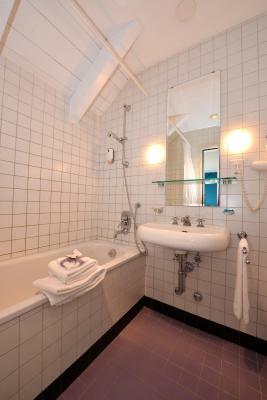 All rooms at the Loge Hotel feature elegant Italian furniture and have a flat-screen TV and a private bathroom. Guests enjoy free access to the cinema, which shows art-house movies in the original language. 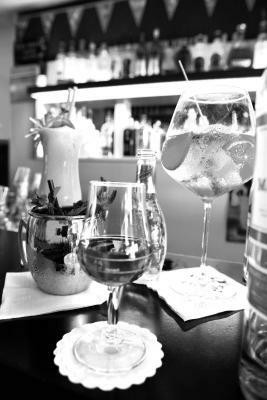 A wide range of drinks and a selection of high-quality gins can be enjoyed at the bar. Winterthur Main Train Station is only a 10-minute walk away from the Hotel Loge, and the Winterhur Art Museum is 6 minutes away on foot. 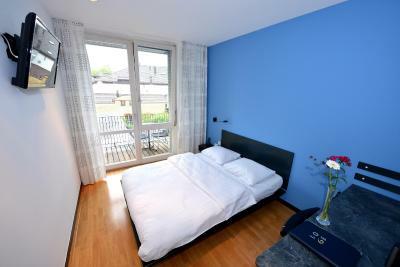 This property also has one of the top-rated locations in Winterthur! Guests are happier about it compared to other properties in the area. 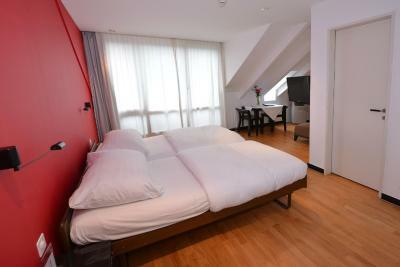 When would you like to stay at Hotel Loge? 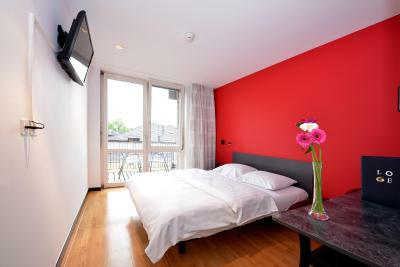 This room features a flat-screen Tv with cable channels and a mini bar. 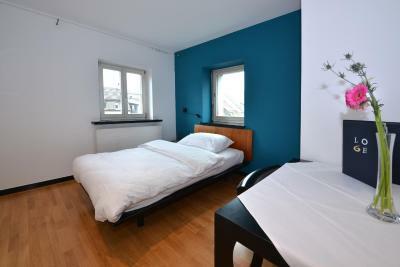 This is a spacious room with bigger beds. We are happy to welcome you to our movie theater on the ground floor next to the bar. As our hotel guest you have the benefit to enjoy complimentary movies. House Rules Hotel Loge takes special requests – add in the next step! Hotel Loge accepts these cards and reserves the right to temporarily hold an amount prior to arrival. Breakfast is poor with only a small selection available. Does not always seem staffed. The breakfast selection wasn’t the best but I was happy with everything else. Difficult to figure out the parking situation, but there is s parking garage nearby. Minor issue. Very good breakfast. Friendly personal. 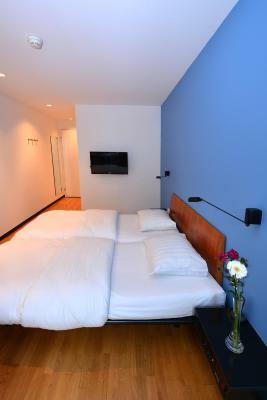 Clean and comfortable rooms, some nice extras like free cinema tickets and daily travel passes for the busses and trains in the city for the duration of the stay. Staff are very helpful. The shower was broken and the toilet leaked. Noisy location. Boring breakfast. Arty hotel. Welcome drinks at the bar. The receptionist who handled our check-in and check-out was exceptional! It's rare to witness this kind of customer service attitude and friendliness and genuine interest in guests. We felt very welcome in this hotel, too bad we only stayed for one night and didn't have time to benefit from the free movies this hotel offers to its guests. 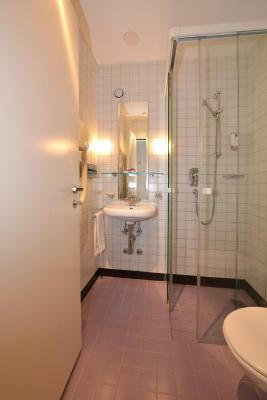 The hotel room was a bit smallish and not very modern, but overall our stay was very good.